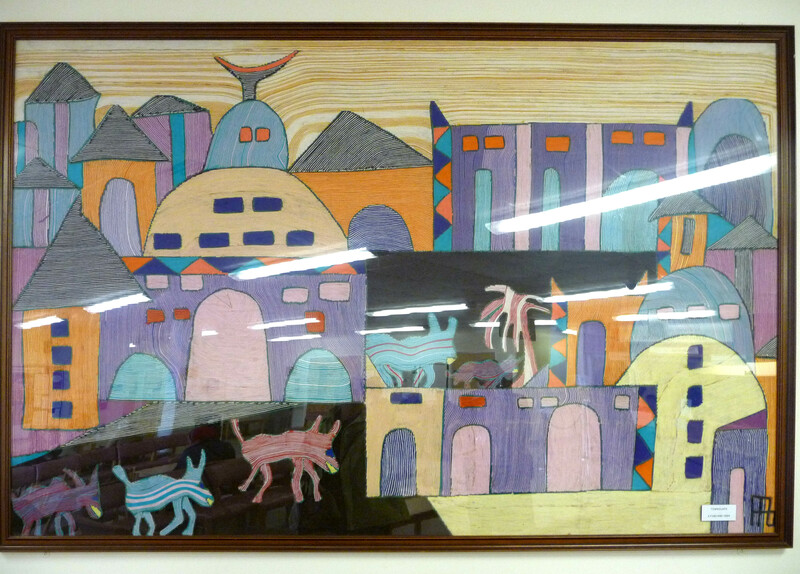 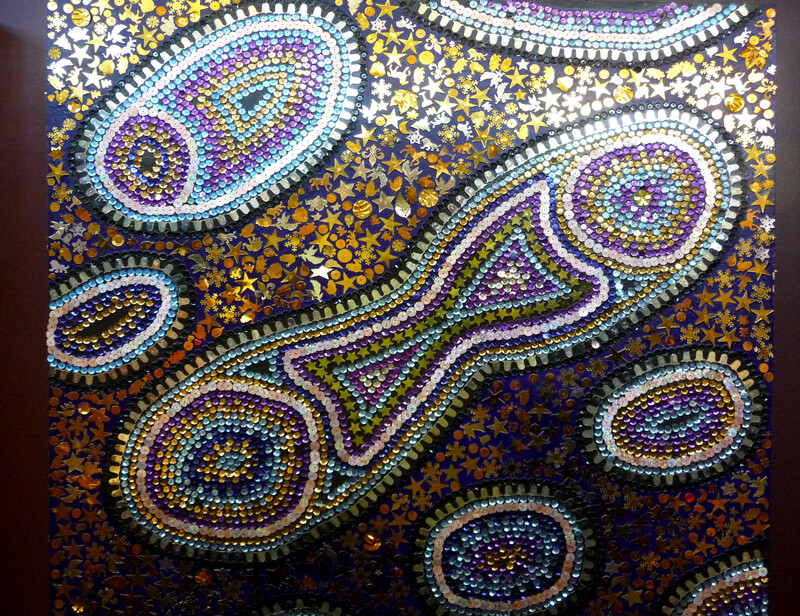 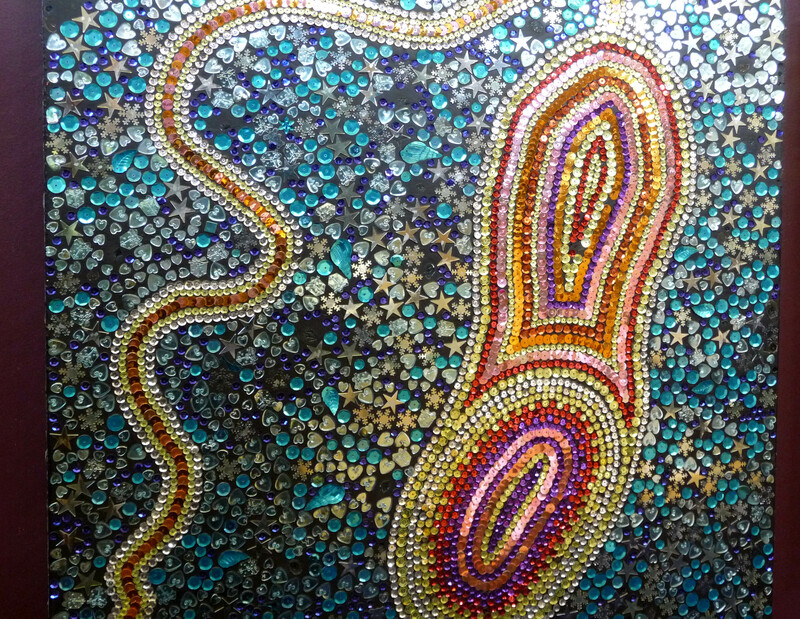 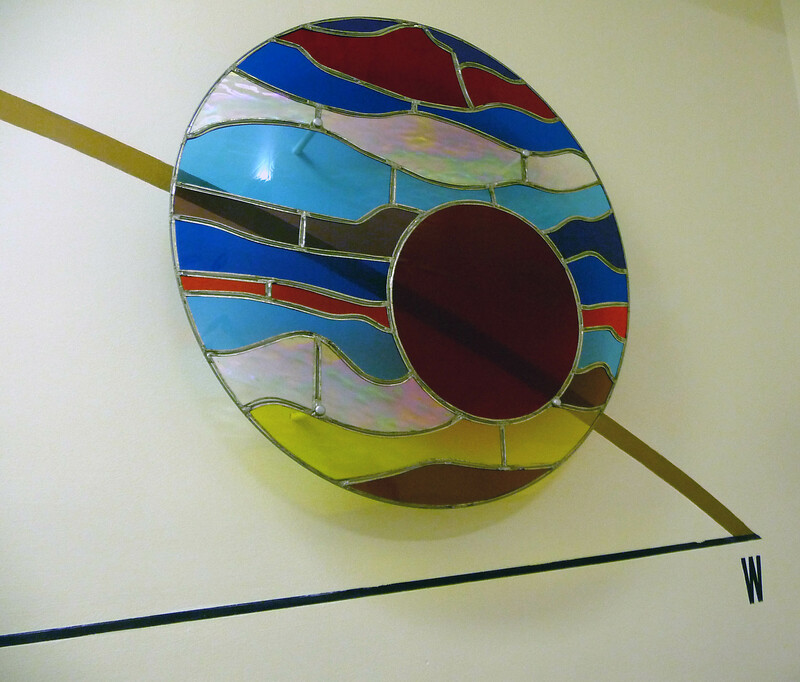 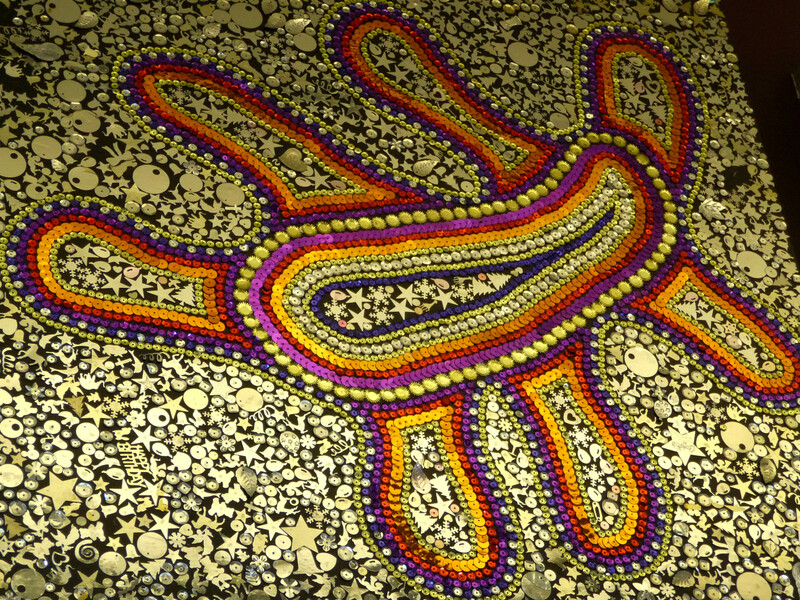 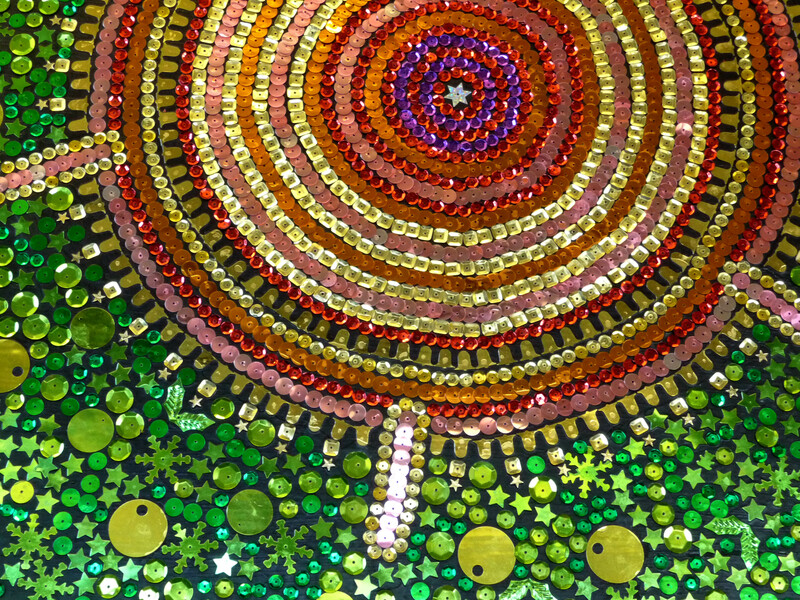 The Pool of Life Wall Hanging, 1995, designed and worked by Norma Heron. 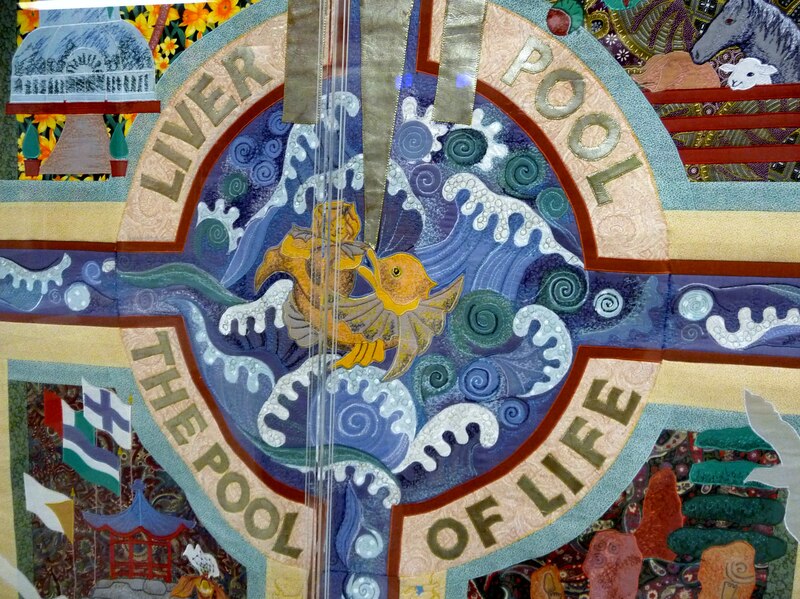 “The Pool of Life Wall Hanging” was commissioned by Liverpool Women’s Hospital NHS Trust in 1995, and was designed an worked by Norma Heron, who is a member of Merseyside Embroiderers’ Guild. 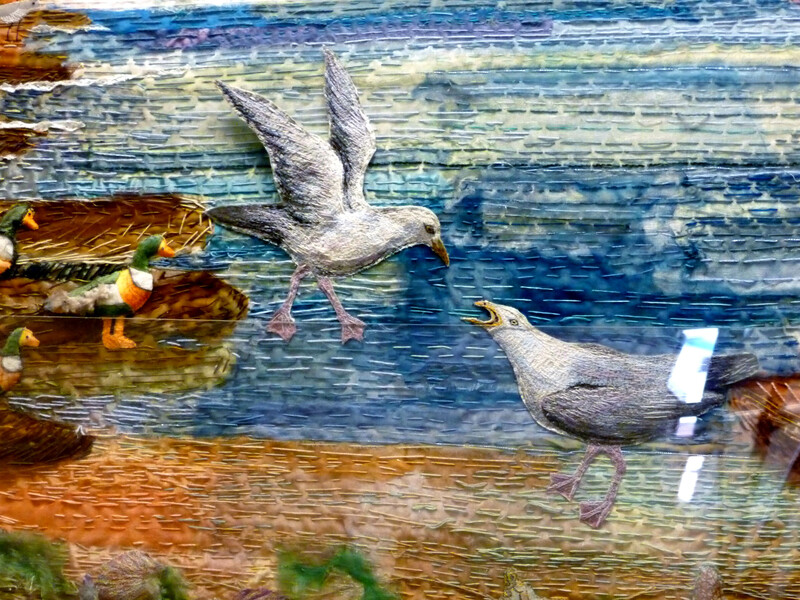 The embroidery was situated in Liverpool Women’s Hospital main reception area for many years, until the hospital’s recent refurbishment when it was placed in storage. 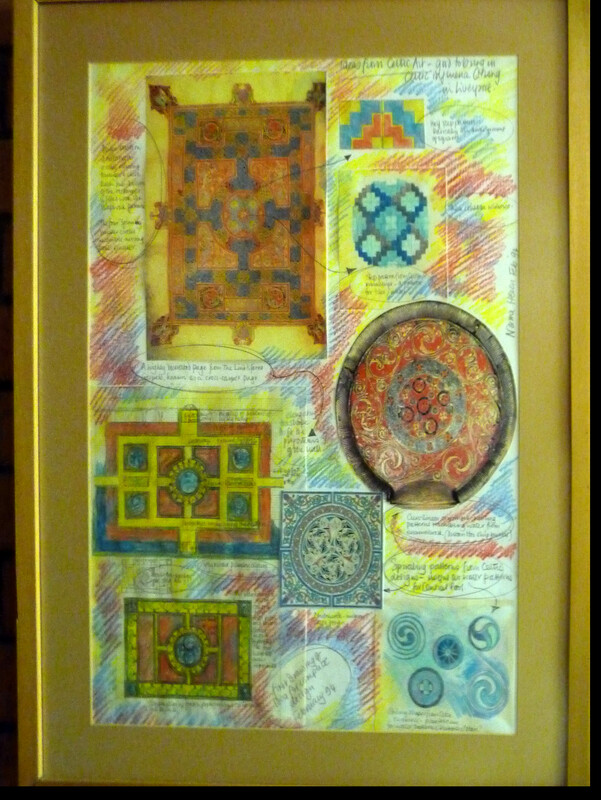 The hanging has now been professionally cleaned and has been rehung, protected by a perspex screen. 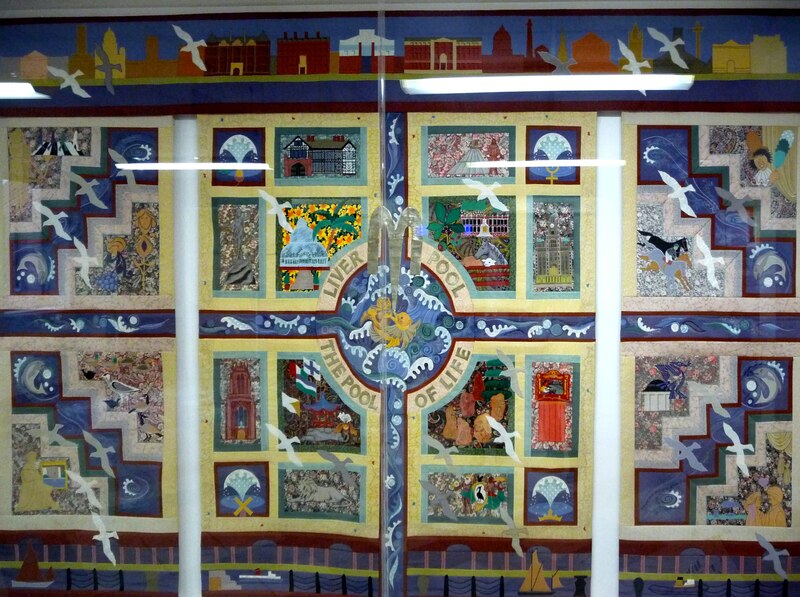 Merseyside Embroiderers’ Guild offered to make a large 3-piece hanging for one of the staircases in Liverpool Women’s Hospital, Crown St, Liverpool, Merseyside L8 7SS as a companion piece to “The Pool of Life”, which was commissioned in 1995, and designed and embroidered by Norma Heron. 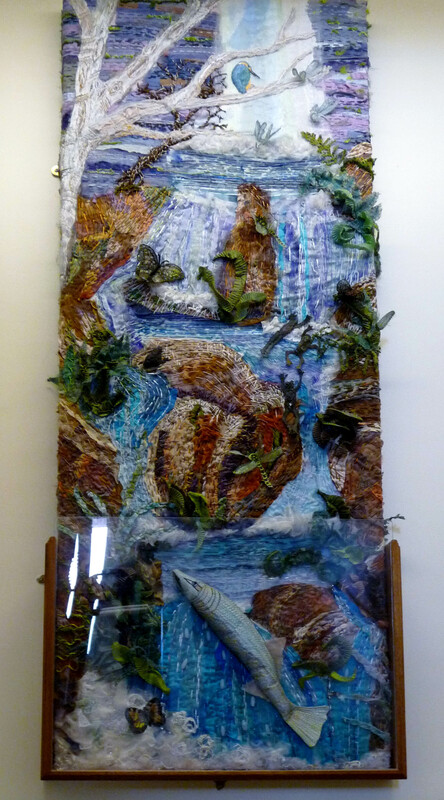 The hospital paid for all the materials used, and Merseyside Embroiderers’ Guild members donated their time and skill in embroidery to the project. 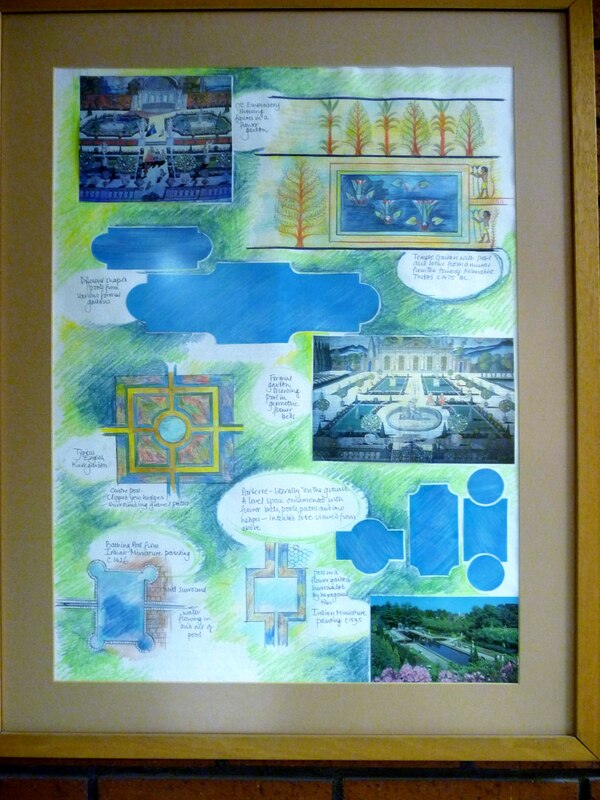 The Estuary Project was a group effort with ideas canvassed from all members and planning meetings held. 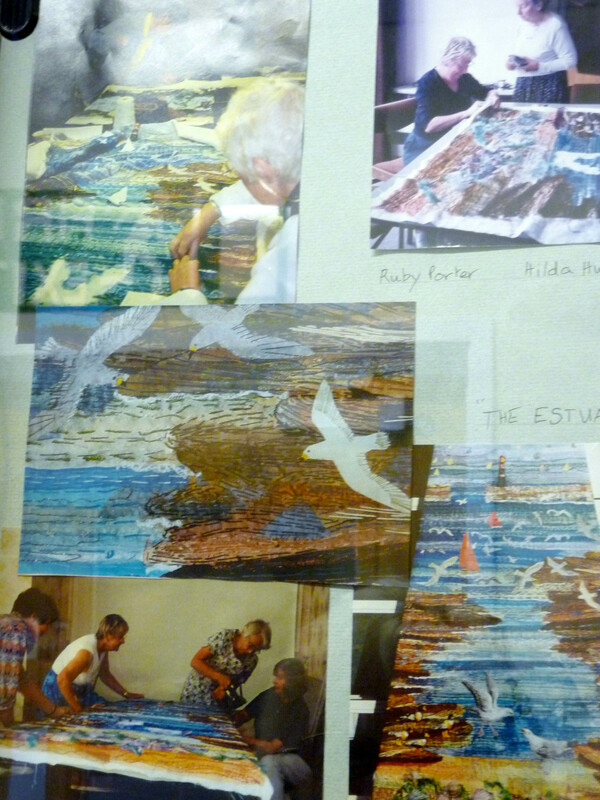 Sketches were made, the main design was transferred to 3 large pieces of linen fabric and stitching began. 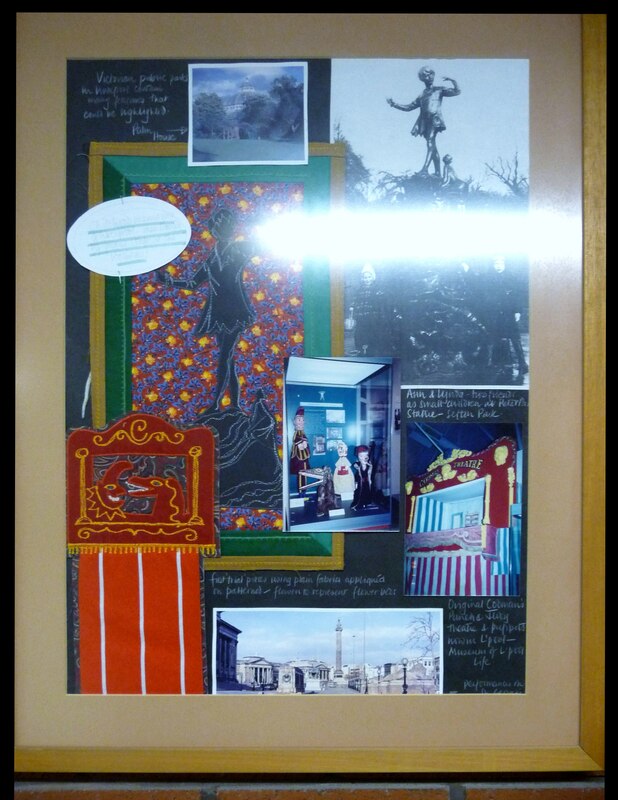 Members of Merseyside EG worked on the three 6ft sections of the hanging for two years either at the Friends Meeting House or in individual members homes. 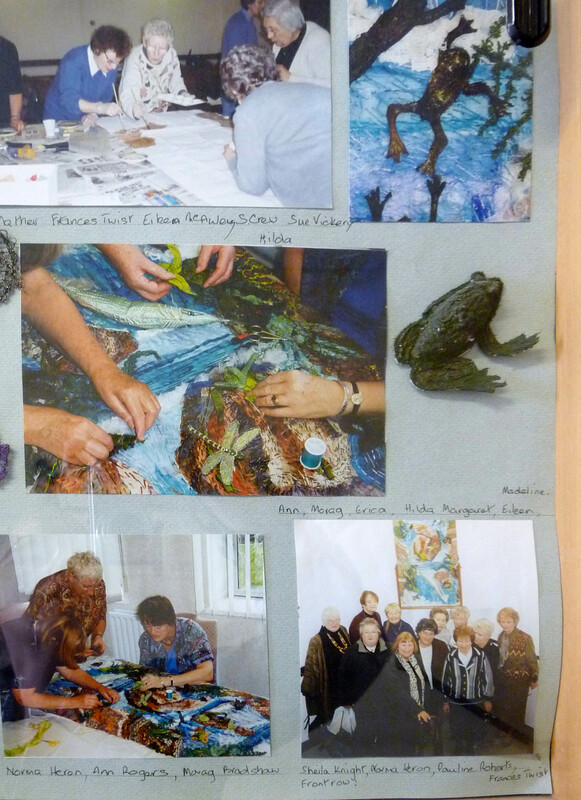 Individual items, the ferns,fish, and frogs etc. 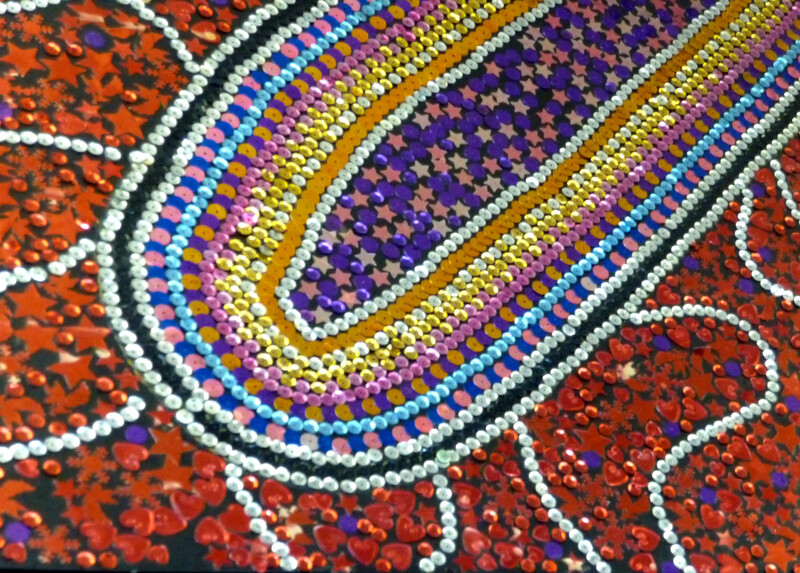 were made by members at home. 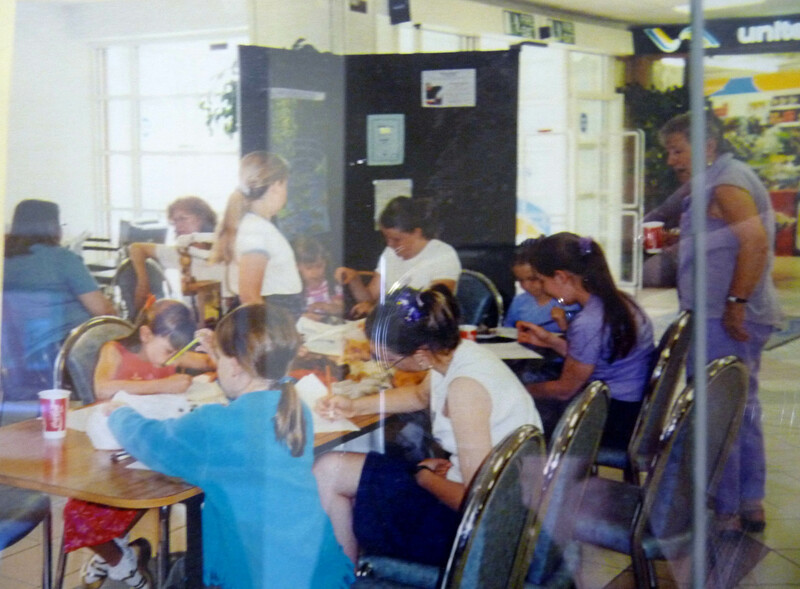 All members were encouraged to contribute and attend whatever their experience. 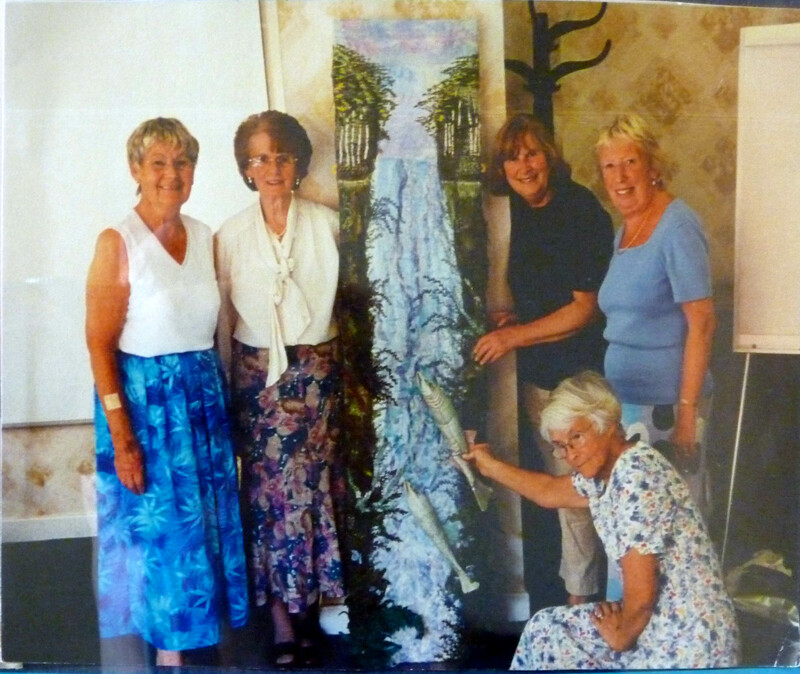 Members found it a most enjoyable and exciting project and one which helped members to get to know each other better. 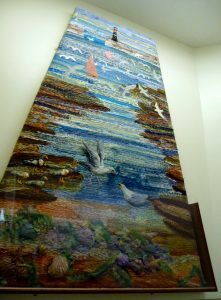 At times up to 17 members attended Workshops to work on the hanging, under the guidance of Norma Heron, who designed and embroidered “The Pool of Life”, an embroidery which is also in Liverpool Women’s Hospital. 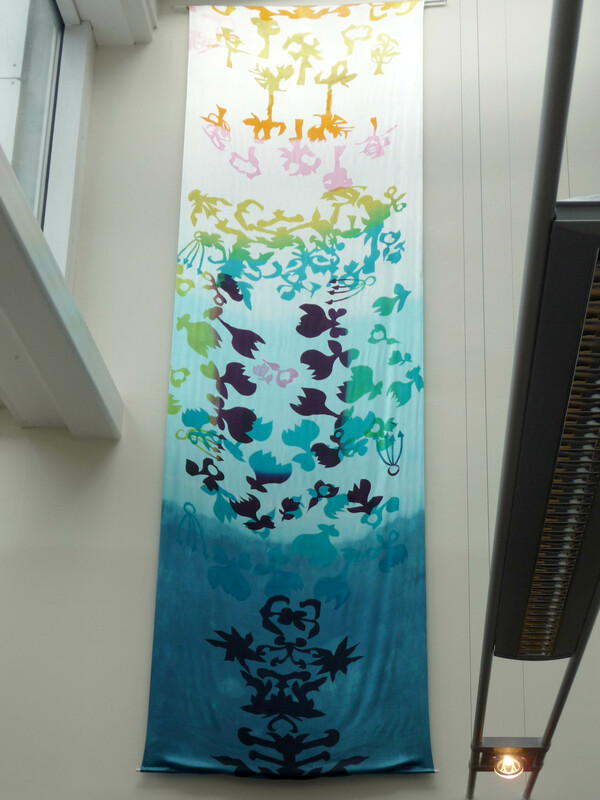 The Estuary Project embroidery is situated on three floors of a stairwell on the ground floor of the hospital, and is available to view. 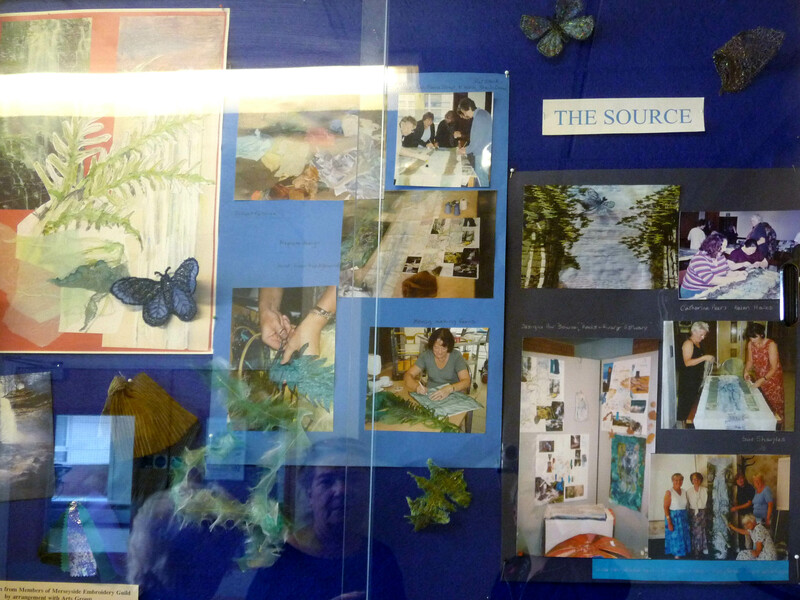 To view The Estuary Project enter Liverpool Women’s Hospital by Main Reception and turn left (as above). 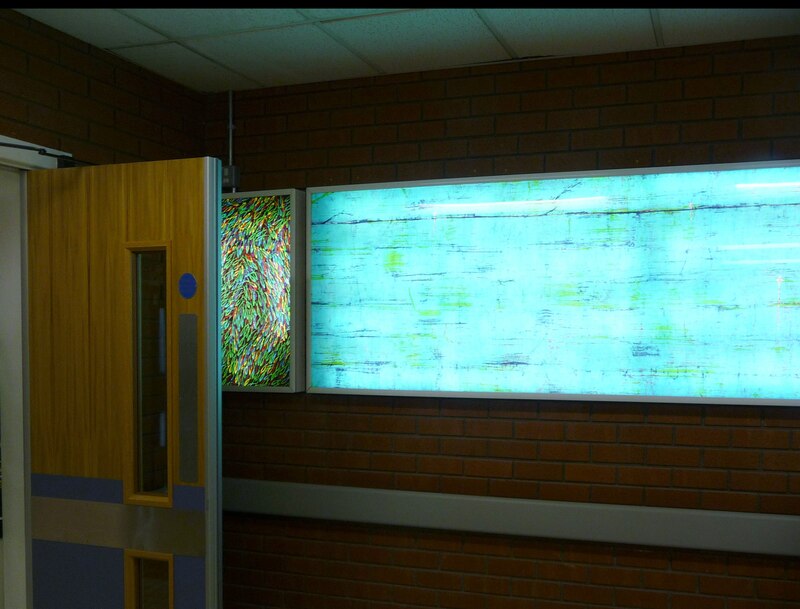 Follow the signs towards Emergency Admissions and keep on a direct path towards the othe Exit . 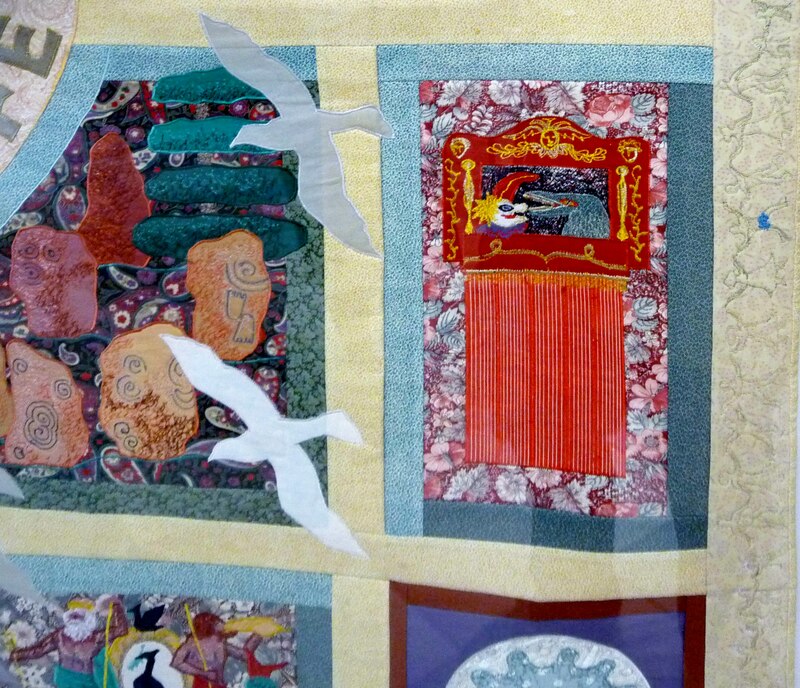 Near the other Exit, on the left side of the corridor is Staircase 1, and the embroidery is hanging on the 3 landings of the staircase. 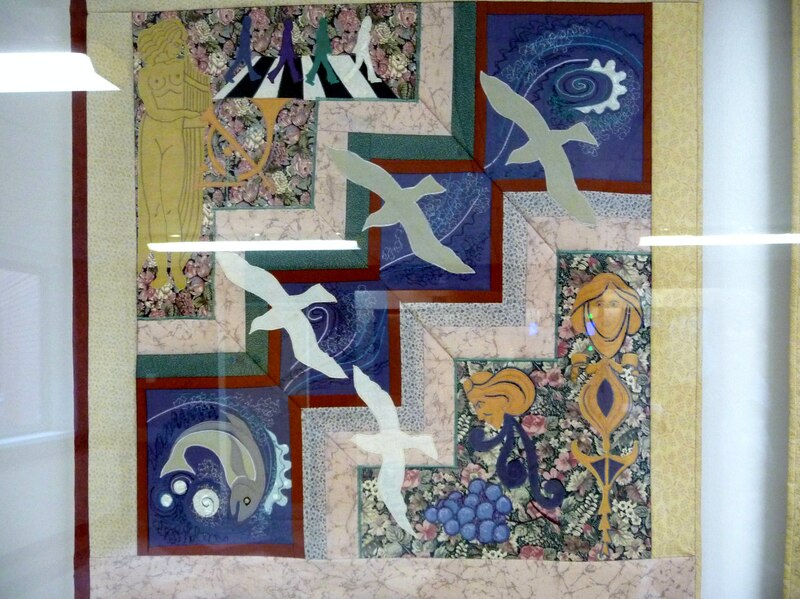 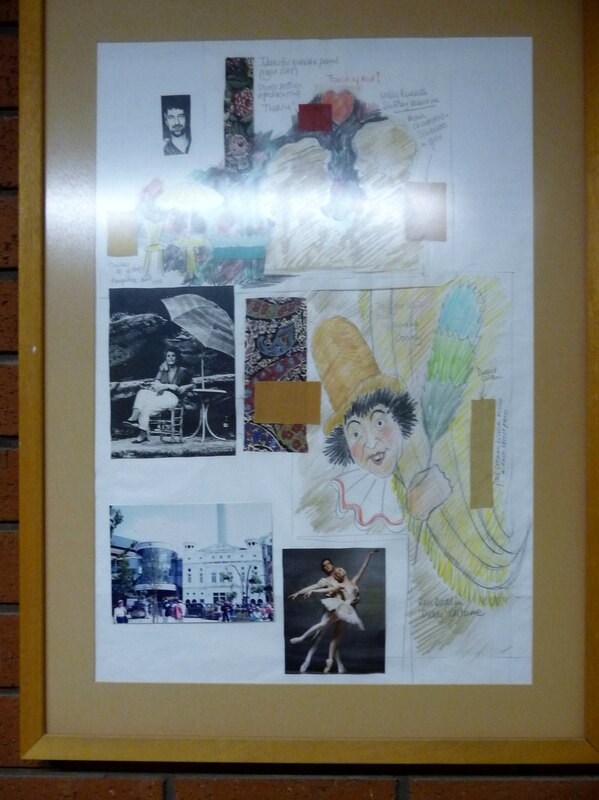 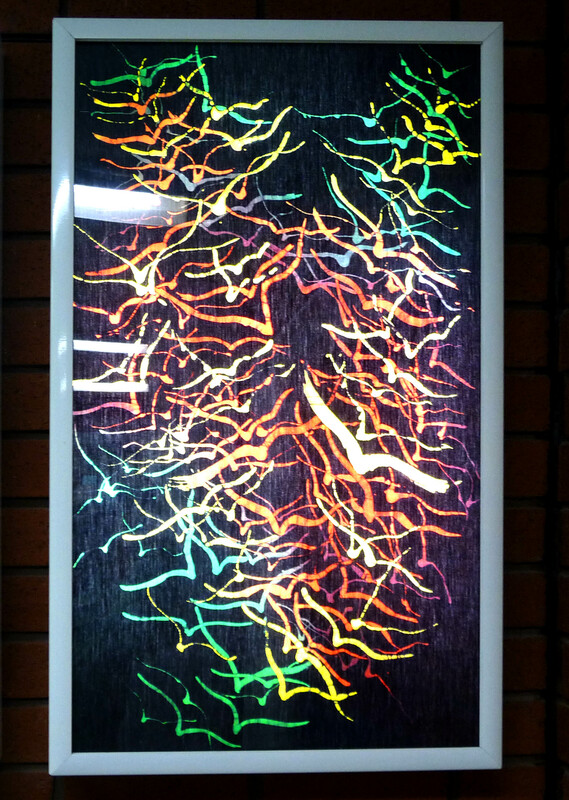 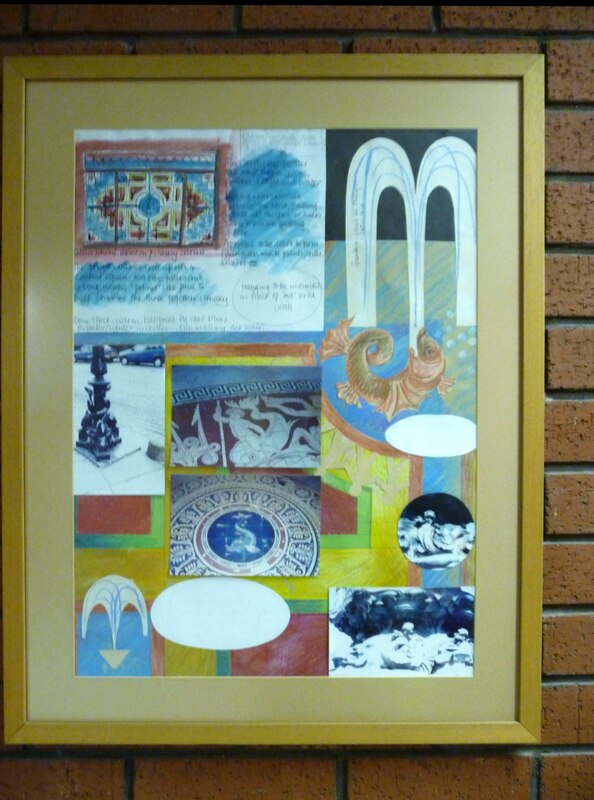 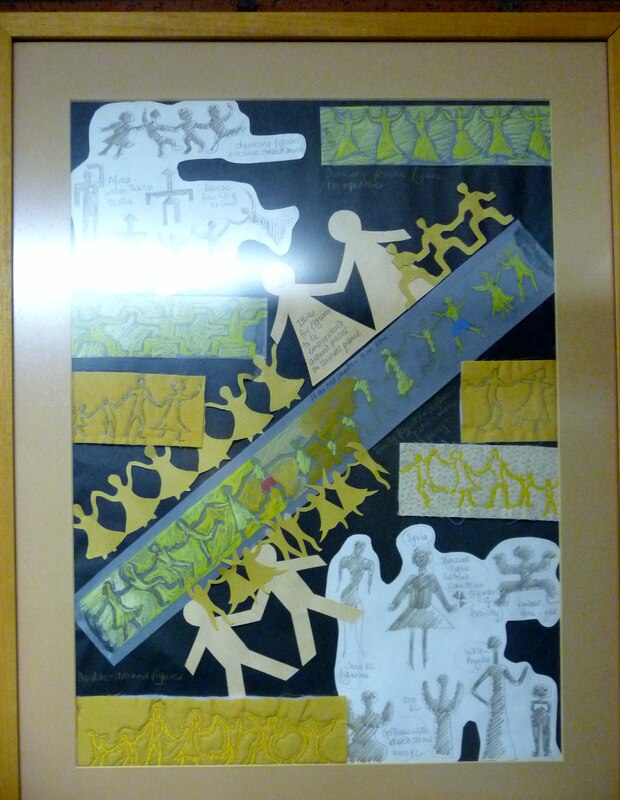 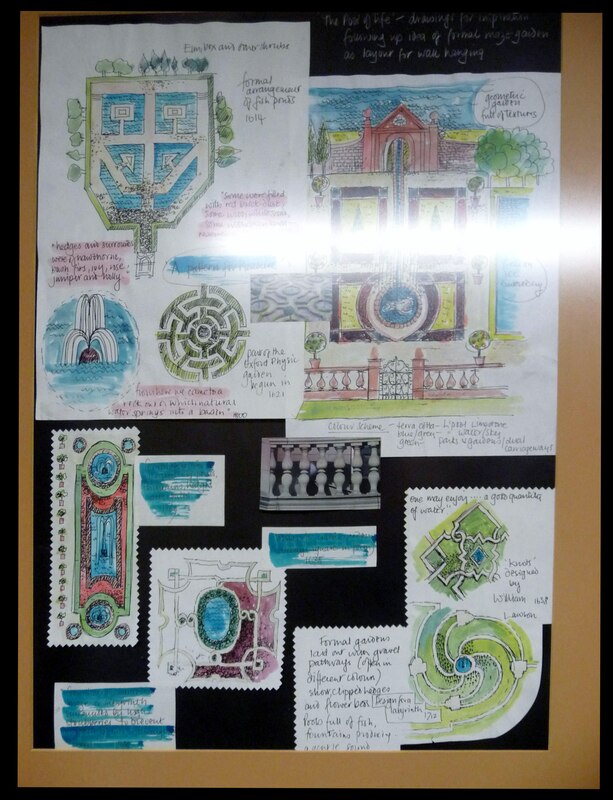 There are many artworks, both textile and other media, to be found in Liverpool Women’s Hospital. 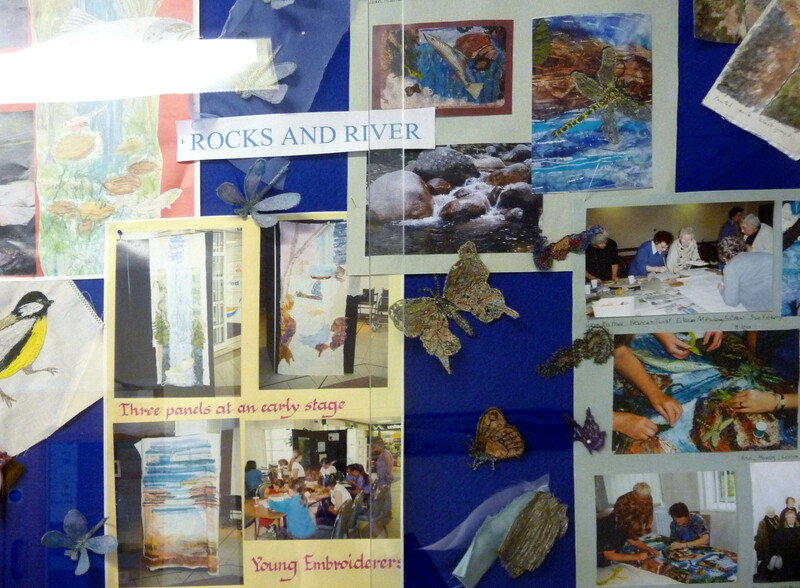 Some are accessible to the general public and some are situated in Staff Only areas. 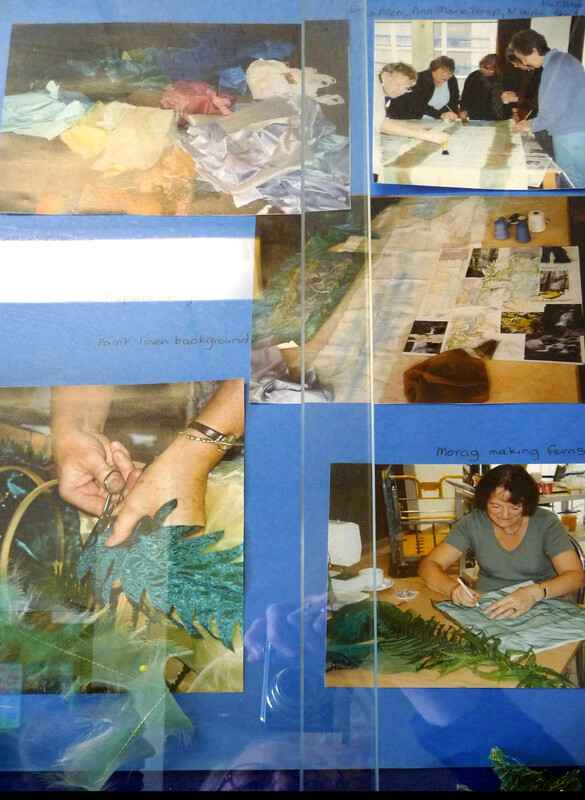 You may view a few of them in these photographs. 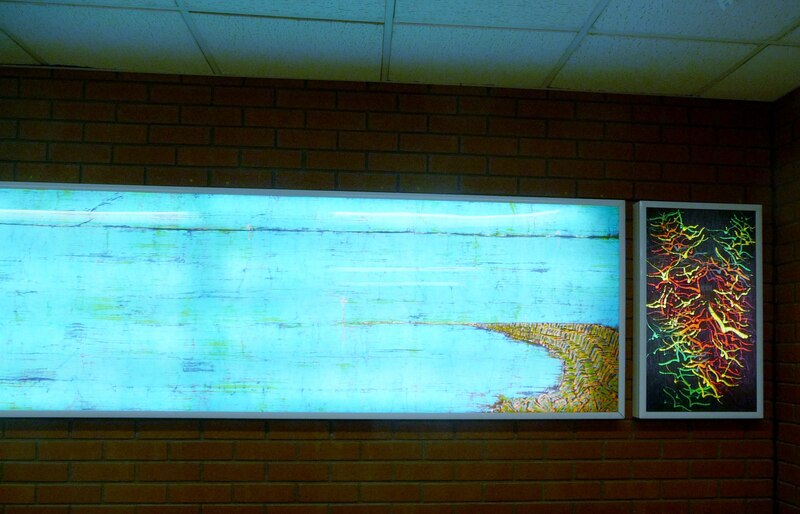 In the ground floor corridor you can see Sian Hughes magnificent batik “The Estuary” which is shown to good advantage with light behind. 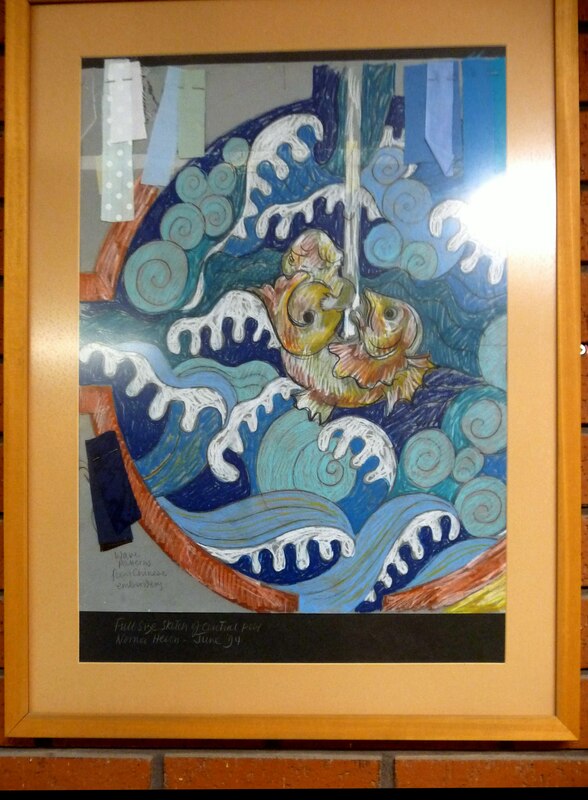 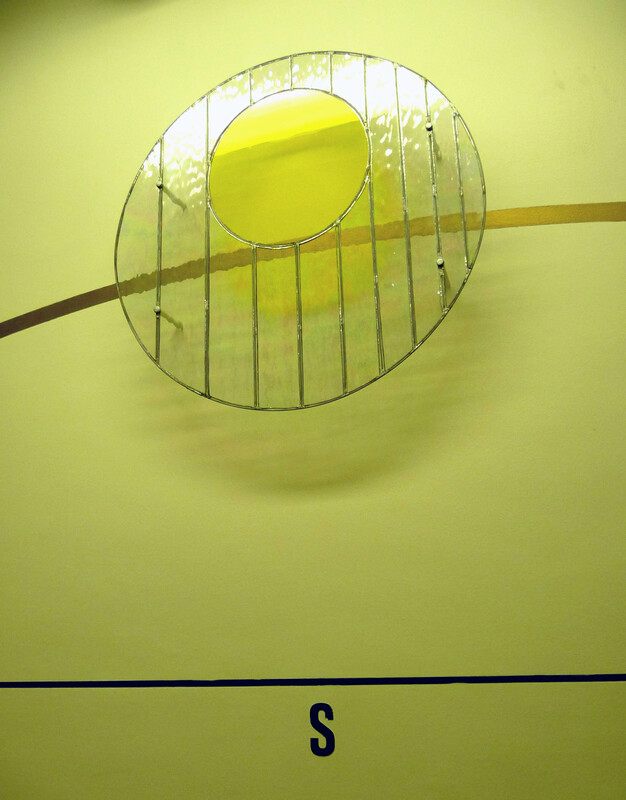 I also saw “Motions of the Sun” 1998 by Alan Dittman. 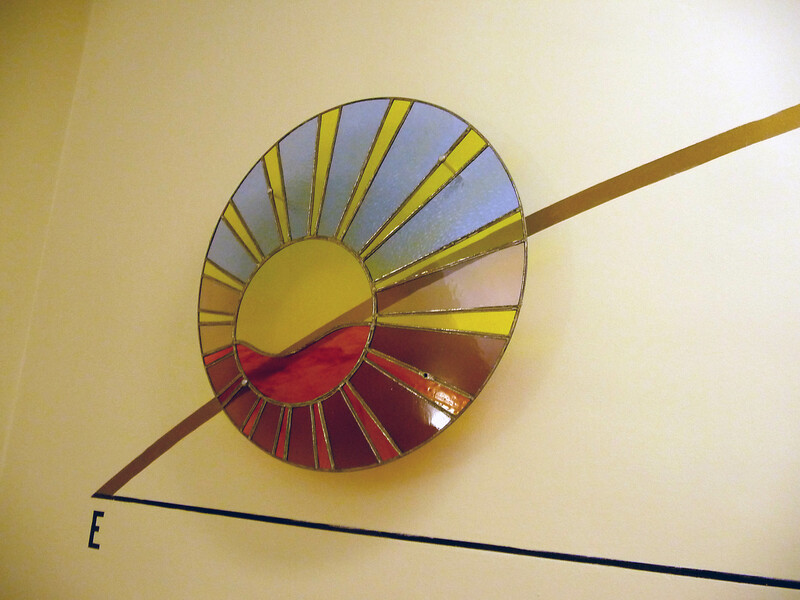 This is a glass tryptich and the inspiration for it arose from a book by Janet McCrickard titled “Eclipse of the Sun- an investigation into Sun and Moon Myths ” 1990. 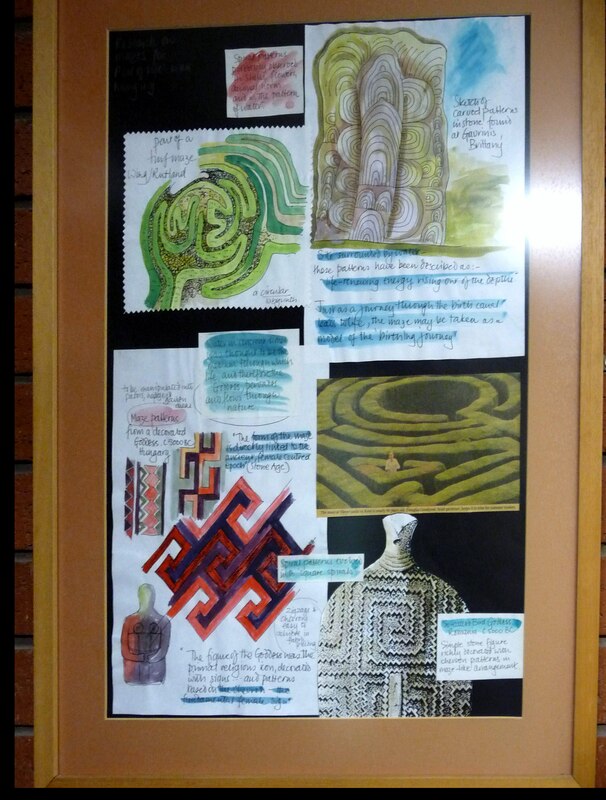 The book set out to explore myths and legends from around the world. 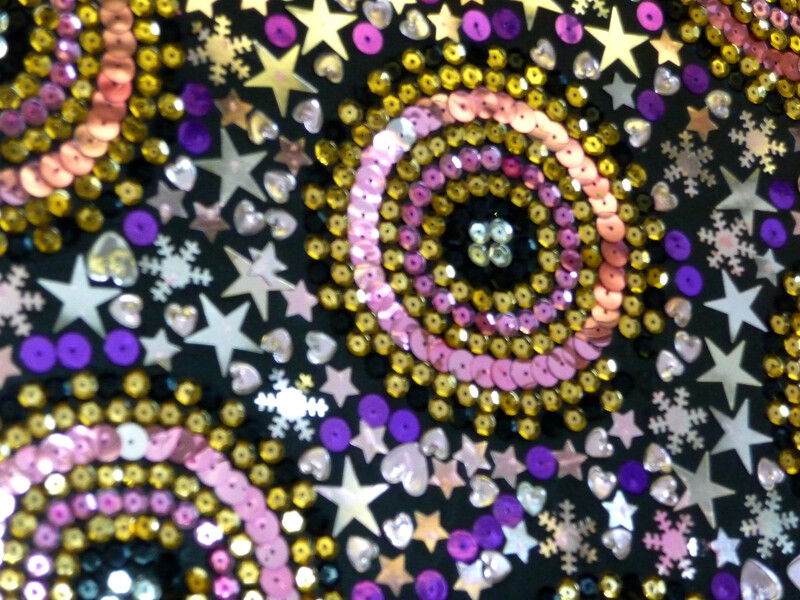 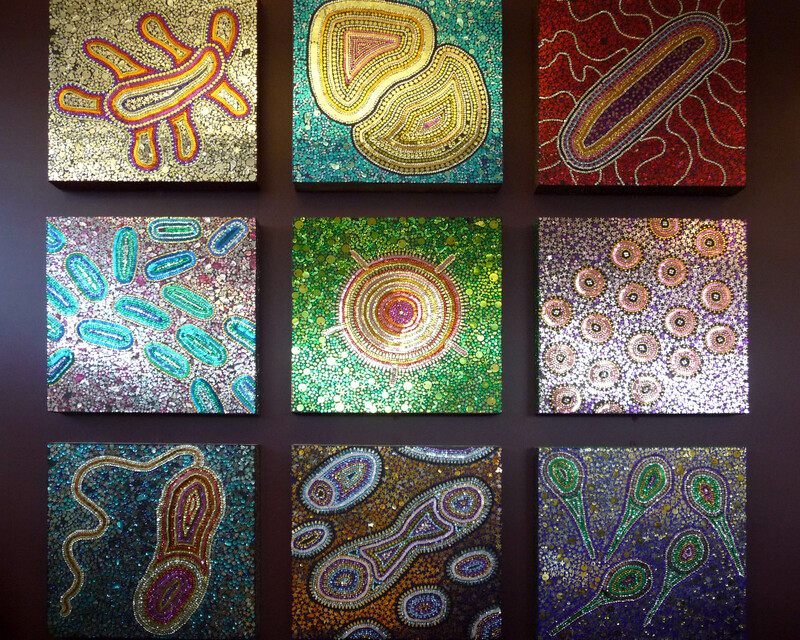 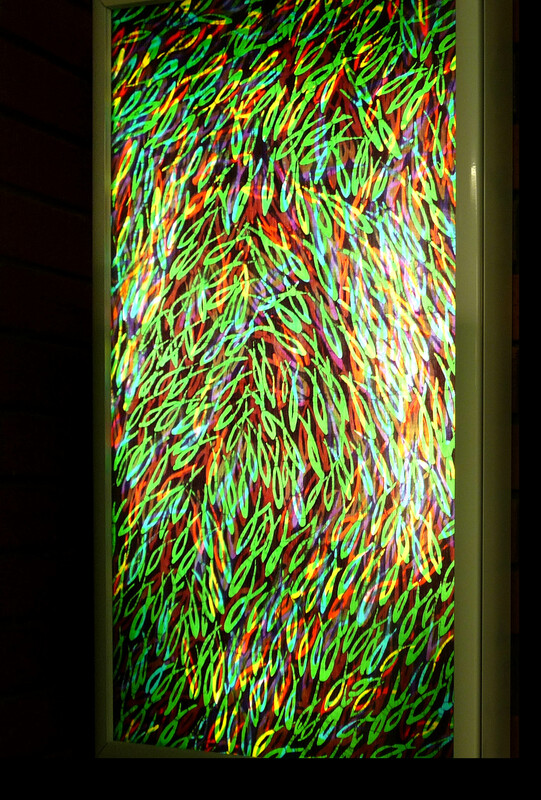 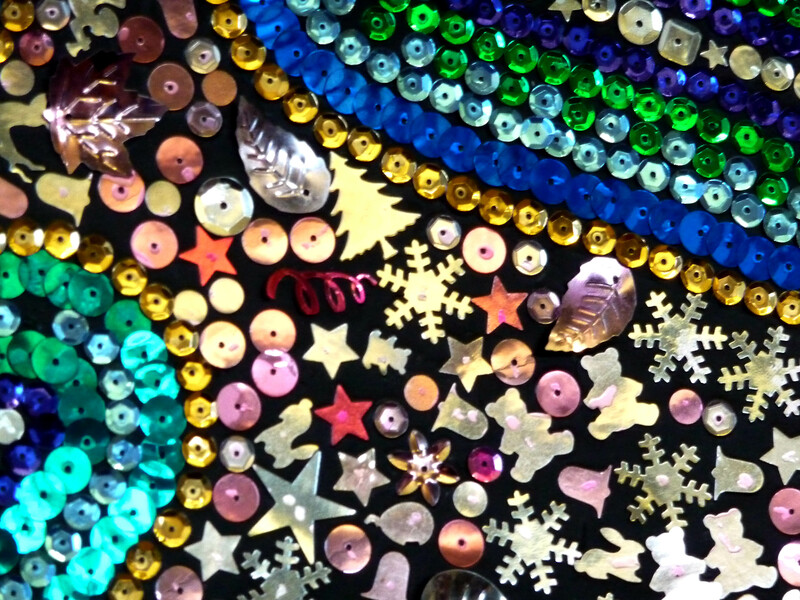 In the Staff Library is a large panel, very shiny with sequins, depicting microcsopic images of various bacteria. 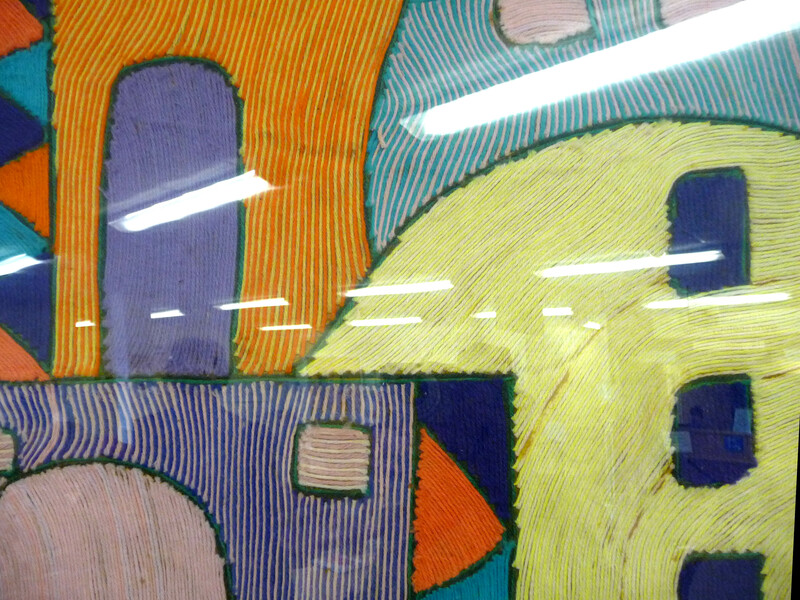 The shapes and colours are inspiring . Also, situated in the Out-Patients Waiting Room, is a large panel depicting a town, which has been made by laying strands of wool side by side- a very slow procedure, I think. 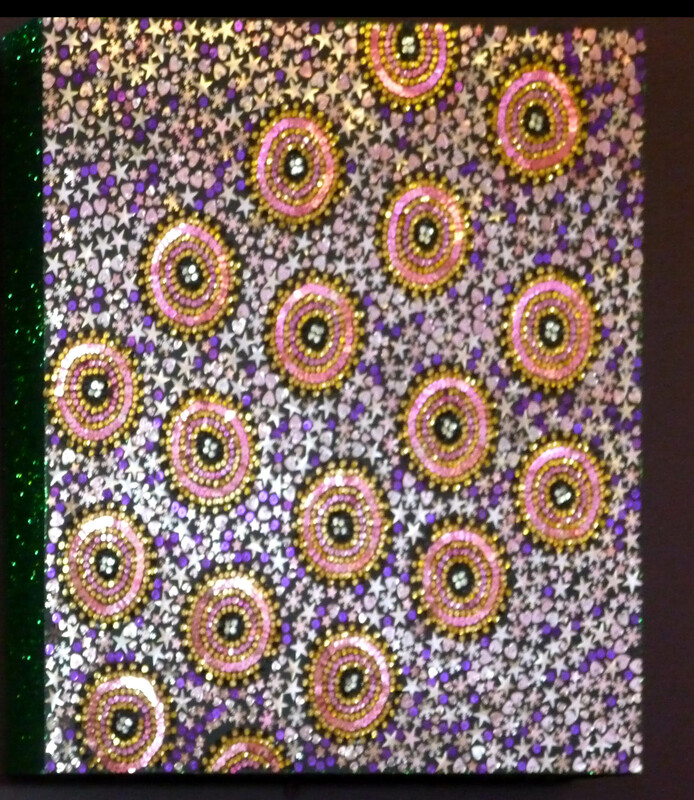 The result is very effective, with a good blending of colours.